Mount Carmel Residential School has an ideal environment for the children to have a close bond with nature. 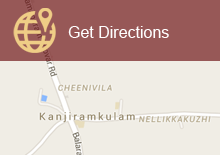 The school is situated at Muzhakolkunnu, about a kilometer from Kanjiramkulam Junction. The pollution free atmosphere ensures a healthy campus. The rich oxygen and plastic free zone add to this. The cool coconut palm glades, the lush green lawns, the green gardens, the fishponds and lily ponds with bridges crossing them, altogether contribute a special charm to MCRS, and classify it as an environment friendly school in Trivandrum. The school is monitored by a closed circuit monitoring system. Cameras are fixed on the ceilings of all class rooms, office rooms and other places that require constant monitoring. The visuals recorded by t5he cameras are transferred to the computer system in the Principal’s office and in the Administration Office. These visuals are also transferred to the school smart phones. The school has Security officers on duty round the clock. Visitors should note their name and purpose of visit in the register, kept in the Security Cabin. There is a separate parking area for vehicles for visitors. School buses have a specific parking area. Separate shed is provided for parking the bicycles of pupils. There is also allotted parking space for the staff’s vehicles.